Earlier this morning we shared a ton of new leaked items datamined within the latest update for Fortnite, but one in particular caught our eye. 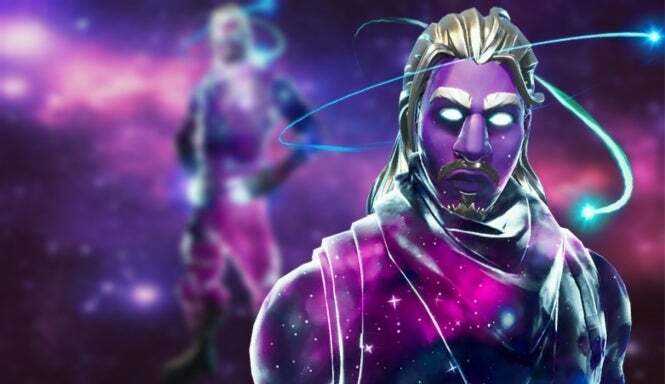 The stunning galaxy skin, seen below, looks unlike anything we've seen thus far making it an enticing new item to unlock when taking to the storm. If you were hoping to scoop it up in the item shop, however, we've got some potential bad news. According to recent reports, the galaxy set won't be available in its usual sense which leads many to believe this may be an Android exclusive. As it stands, Fortnite is available on Xbox One, PS4, Nintendo Switch, PC, and iOS. The news that it was coming to Android has been known for quite some time now, though a release date has yet to be given at this time. We know it's coming soon, however, because Epic Games maintains their schedule of a Summer release and with the arrival of the datamined skin uncovered within the game's files - the timing lines up perfectly for it to be a celebratory addition to the game. Given that the most prominent Android device is the Samsung Galaxy line, the theory definitely matches up. Whether or not that is in fact what this is remains to be seen as this is simply a leaked item at this time and in no way confirmed from Epic Games themselves. Still, the original source of the datamine is known for its accurate intel. They've appropriately revealed ever cosmetic item update thus far since Season 1, day 1. Still, until it's confirmed - take this new info with a grain of salt. Perhaps we will even see an official announcement later on today! In other Fortnite news, the latest patch is now live. You can see the full patch notes right here including the brand new Limited Time Mode 'Steady Storm,' the changes made to vending machines, and the newly added double barrel shotgun!